In spite of being sick most of the summer, we actually had a wonderful summer. 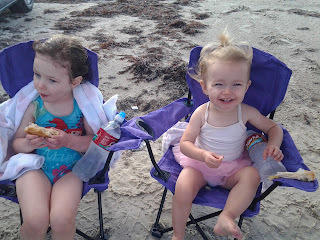 This is the first year that both girls have enjoyed the beach, so we took full advantage and went to the beach a lot. Our favorite time of day to go is late afternoon, after nap time is over. 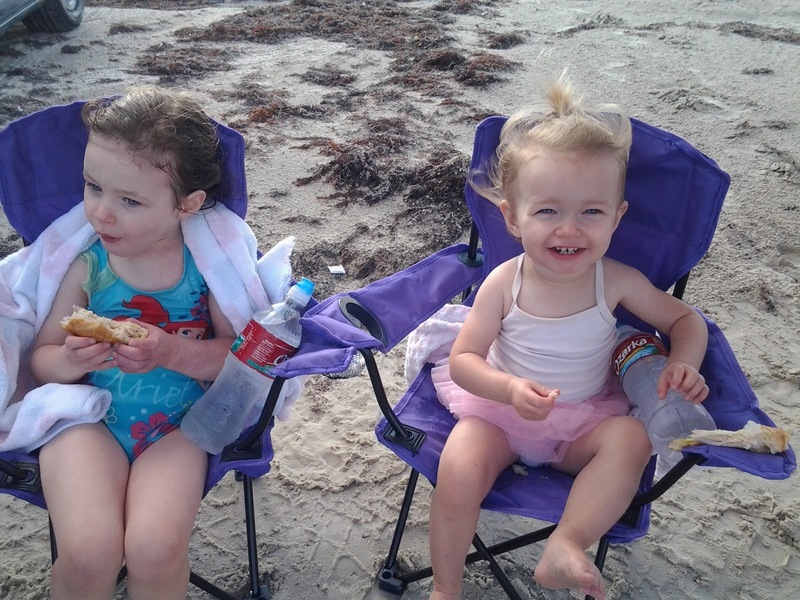 We would pack a picnic dinner, some beach chairs, and head out to the beach. Holly and Josie enjoying their sandwiches. 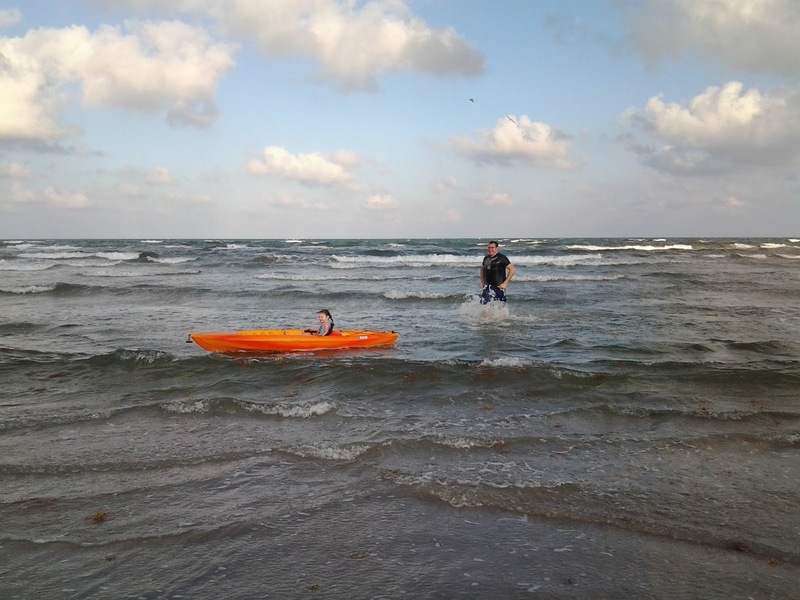 We went to the beach with cousins several times, and Andrew decided to give Holly a (rather tame) ride in a kayak. She was in love with the idea until she actually got in it. 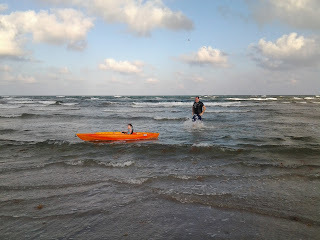 When they made it back to shore, Andrew told me that Holly kept desperately trying to jump out of the kayak. 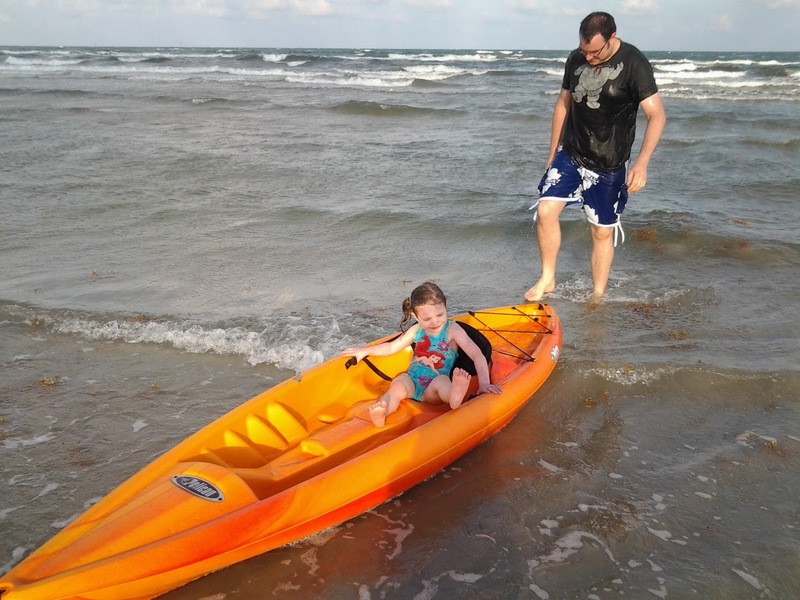 What's not to love about a kayak ride where all you're required to do is sit and enjoy it? We also made, and enjoyed, our fair share of treats. 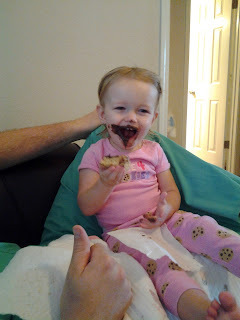 Josie is a junk food monster and will gladly sacrifice eating her dinner in hopes of dessert. 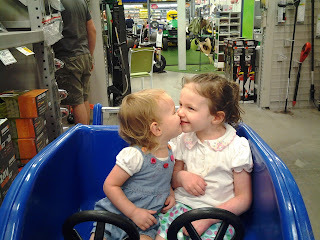 Lowe's continues to be our home-away-from-home and the girls accompany us often. They like going lots more if a fun car shopping cart is involved. It seems like the list of projects to be done on our house will never end! This summer we decided to go for it and register Holly for swimming lessons. 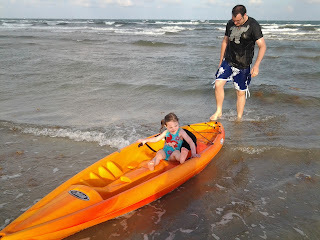 She had a blast and learned a lot (she is not an Olympic-level swimmer yet, but has gained much confidence in the water). She took a two-week session which consisted of four lessons per week. Incidentally, this particular session happened to fall right when I found out I was pregnant and all the fun began. So needless to say, taking her to a 9:00 a.m. swimming lesson was about all I could handle every day. Holly had just turned three and was the youngest child in her class, by far. I was so proud of her and thought she did so well! The only person who wasn't pleased with the arrangement was Josie, who was mad that she couldn't get in the pool and swim, too. We actually had a few close encounters with the water slide and, luckily, there were other moms more with it than I who saved her life. Although she certainly didn't see it that way, of course. We are looking forward to swimming lessons again next summer! Actually, make that the last 3 months. I really have no excuse from April through June. But from July to the present, I have been absent from blogging, Facebook, and all forms of socialization because of this. 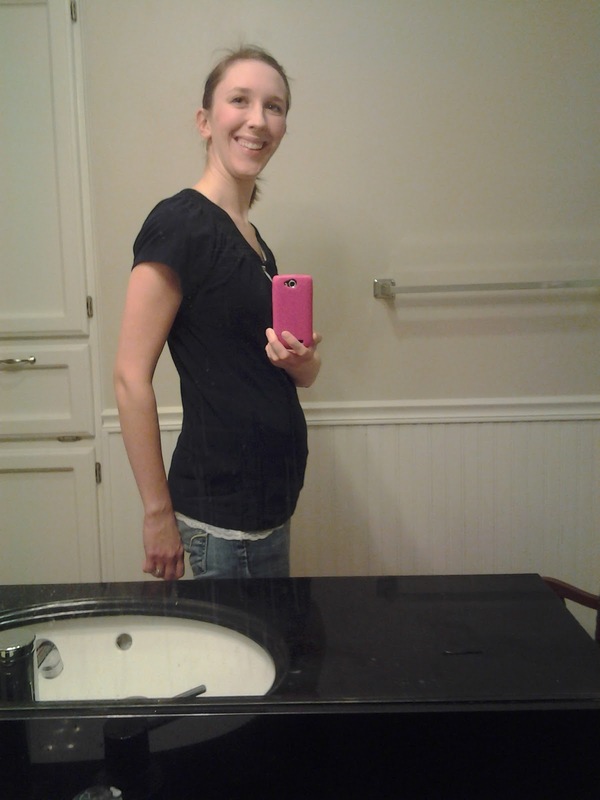 A new baby bump! Hooray! This picture is seriously outdated because I'm about halfway through this beast of a pregnancy and much, much bigger. But I seriously spent all summer laying on my couch in various states of consciousness while the poor girls watched PBS Kids and did things like this. 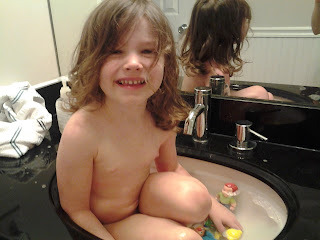 That is Holly taking a bath in the bathroom sink. Which, actually, I would not have even known about had Josie not flushed the toilet approximately 35 times in a row and alerted me to the situation. And this. 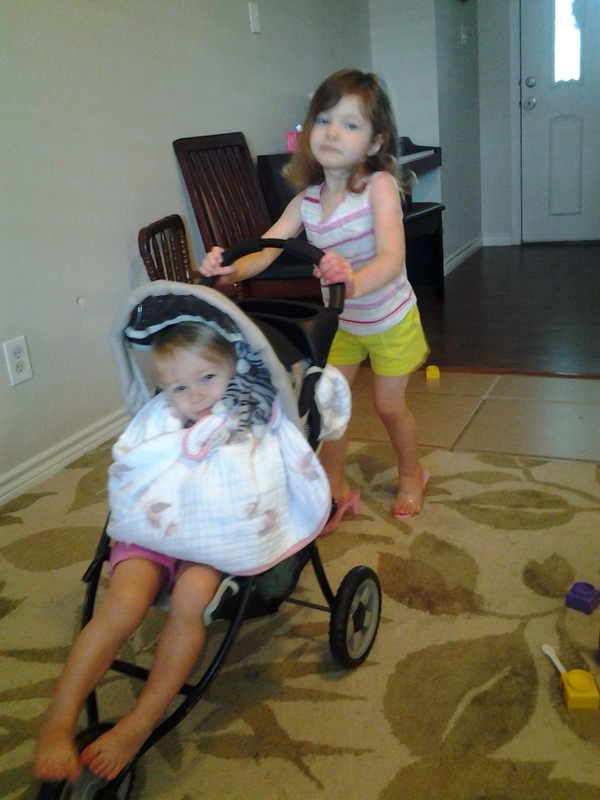 Pushing each other around in the baby doll stroller, which is about to collapse after having been subjected to more than it can handle. The good news is, I am not so horribly sick anymore. Just tired beyond belief and suffering from terrible migraines and other various ailments. Which leads me to my other piece of exciting (and related) news: this baby is a boy! We are still in shock, I think. 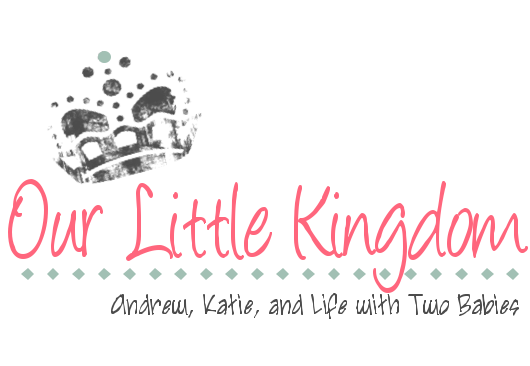 We are so heavily into girl mode (even my precious husband Andrew) that we are still adjusting to the idea of having a baby brother. I'm actually just relieved that we had two girls first and I know we will absolutely adore him when he arrives. So, I will do my best to combat fatigue and everything else and catch up on my blog. Let's just all forgive me and move forward from here, okay? Our sleeping arrangements for the girls have been sporadic at best. Theoretically, they both sleep in the same room. In practice, Josie sleeps in a pack-n-play in our extra bedroom 9 nights out of 10. It's just easier this way, somehow. When they do sleep in the same room, it is a party for at least an hour. There is much squealing and laughing and playing and not a whole lot of sleeping going on. Then, when I go in to check on them after all is quiet, I am confronted with the above and below images. Sweet girls. How can your heart not melt at this sight? Both sleeping together in the crib like that. I'm always tempted to leave them that way, but end up moving them to avoid confusion and/or a fight at 3:00 in the morning. This spring and summer, we've spent a good deal of time out at Andrew's parents' property. (That was complicated. My in-laws' property--that's better.) Anyway, the girls love it out there because there is a huge expanse of yard to run around in, gardens to trample, dogs to chase and be chased by, and a host of other things. One of the more recent favorites is riding the lawnmower with Daddy. Andrew goes a bit stir crazy and spends most of his time outside while we are there, finding things to work on and to fix. The girls were pretty thrilled to take a ride on the mower. We had a wonderful Easter this year. We kicked off our weekend with an Easter festival held at a church near our house. It started at 10:00 a.m., so we naively thought we shouldn't get there too early because it might be awkward to be early birds. Little did we know, the entire south side of the city was there! There was face painting, a petting zoo, Easter egg hunts for all ages (we missed ours by a few minutes), pictures with the Easter bunny, snow cones, bounce houses, and anything else you can think of. Holly had the time of her life and Josie...well, we found out that day that she doesn't like the sun. Or the heat. Or walking around outside. Oh, well. On Easter Sunday, we went to my in-laws' ward and had Easter dinner with them. The girls were the only kids in Nursery, and Josie has a complex with my leaving her behind so I stayed in Nursery with them (which was not awkward at all, with a Nursery leader, a mother, and two children...). Whatever. It ended up being a small crowd out at my in-laws' for Easter dinner, which was just fine with us. We had a wonderful time and really enjoyed spending the day with Grandma and Grandpa. Holly loves art projects. I used to be so good at doing them with her, back when Josie was still taking a morning nap. Since Josie dropped her morning nap though, I have gone into crisis mode and have barely resumed functioning as a normal human being again. Thus we have done almost no art projects for the past couple of months. I finally bought a second set of watercolors so Josie could join in on the fun, and we pulled them out one afternoon last week. Holly was thrilled to be back in her natural element of creating and making a giant mess at the same time. Josie had fun painting on the paper...until she discovered that painting on her face was fun, too. It was everywhere, including in her ears. Painting had to be cut short, and Holly was none too pleased. She let me know by dumping her painting water all over the floor. Fun times.